Majority of premium software CD, DVD discs have autorun functionality. Do you want to similar autorun functionality to CD, DVD dics being burnt on your PC? AutoRun Maker is a free application available in install-able and portable version to create autorun CD, DVD dics and USB drives. 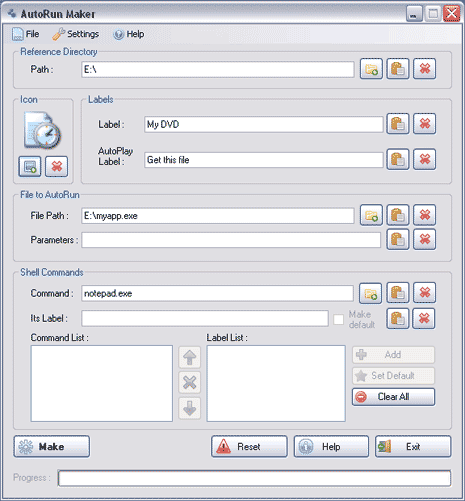 You can assign custom icon, labels and create autorun dics using this application. 1. Add a custom icon for CD, DVD discs & USB drive. 2. Add a custom label text to appear in the explorer. 3. Select & configure any executable file or documentto open at autorun. 4. Add additional shell commandsto show on drive’s context menu. 5. Autorun configuration can be saved for working on it later. 6. Enable or disablethe Autorun feature of CD, DVD drives. Download AutoRun maker for Windows 7, Vista, XP, 2000. It is a free application and requires .NET Framework 3.5 to work either in install-able or portable format. For sure one easy to use and handy application to make auto run dics.